Cash for cars that show off team spirit. Posted November 4th, 2014 by CarSoldForCash & filed under Uncategorized. Cash for Cars in Utah county! and Go Chargers Go! We had such a blast working with Rex. 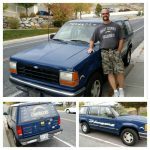 He is one of thousands of families that have turned to carsoldforcash.com as the solution to getting rid of their vehicle. We definitely encounter some unique people and cars while paying cash for cars all over Salt Lake, Provo, Ogden and the sorrounding areas. This one was one of those vehicles and customers that just makes you smile. You can tell by his shirt and by his 1991 Ford Explorer that Rex bleeds blue. It’s always hard to say good by to an old blue automotive friend, but getting some green cash for your car as Max can tell you definitely eases the blow. 27 years of experience buying cars! 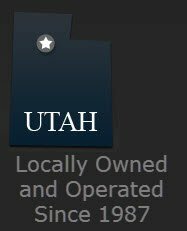 Max isn’t the first Utah countyite we’ve helped get for their car. We’ve been giving cash for cars since before the “Charger-mobile” was brand new of the factory room floor. Since day one our motto and our focus has been how can we help? While yes physically all we are really doing is paying cash for cars; we also aim to emotionally intuitively take care of our customers. It’s hard to know who to trust in this arena of selling your car for cash. You don’t want to get ripped off, but you also don’t want to spend an entire day week or even worse a whole month trying to deal with it. carsoldforcash.com is a locally owned and operated family business. That’s right when we sit around the table to eat dinner we don’t just talk about the weather ;we talk about helping other Utah families just like yourself get cash for cars and cash for clunkers. We aim to not just only provide cash for cars, but to also treat our customers as if they were family while doing it. Whether you are looking to sell a car decked out with team spirit, or you have a nice car that needs a new engine, we can help. We specialize in buying nice cars that need some work but also buy clunkers and pay cash for cars and junk cars too. We love our job and feel that we can provide an amazing service to members of the Orem, Provo, Lehi and sorrounding areas. We’ve paid cash for cars for the past 27 years and hope to pay cash for cars for many years to come.